Found as a lower story woodland plant in New South Wales and Victoria with some populations in Tasmania and South Australia, this is another Australian terrestrial orchid that requires well drained but moisture retentive soil. Flowers appear on tall stems with 3 – 5 flowers on each stem. The lower flowers will open first and then progressivly up the stem. 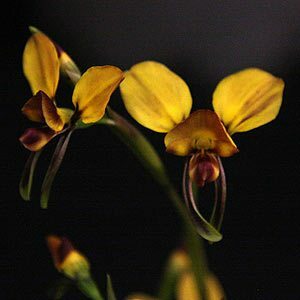 Varied a little in form and color the petals are predominantly yellow with brown to mahogany markings on the lip, flowers will reach around 3 – 4 cm. Height – Variable height from 10 cm to 30 cm depending on soil and conditions. Flower – Flowers appear, yellow with reddish brown markings. D. sulphurea – Commonly called the Tiger Orchid. D. pardina – Known as the Leopard Orchid. D. behrii – Golden Cowslips.